Have you ever known any information about Sapa Vietnam and customary here yet? Hanoi Sapa Trip will help you answer all the questions and inquiries about Sapa where is the most region gentle and peaceful in Vietnam. Come to Sapa, you will feel the life rhythm more slowed, the beat as breathing of natural. Soaking up the lives of indigenous people, learn their daily life brings a endless interesting sense. Besides, sightseeing landscape with the vast rice terraces in Lao cao or walk around old quarter make you feel great. From here, all your fatigue will disappear and you will have a wonderful vacation in Sapa Vietnam. Moreover, Sapa is called one of the best heaven of Vietnam. Coming here, you can feel a fantastic atmosphere of fog around you. You will be deep inside in the thick fog in the evening or in the early morning. So Let Vietnam Typical Tours take you this trip Hanoi & Sapa 5 days and keep all your wonderful emotions in Vietnam. Arrive at Noi Bai Airport, you are picked up by our driver at airport and transfer to your hotel in Hanoi. Check in and rest before you start a half day exploring Hanoi. With our tour guide, enjoy a ride on electric car in the Old Quarter, following with a Water puppet show (45minutes) at the end of the day. Dinner in local restaurant. Breakfast in the hotel. You will start a day visiting Hanoi City with Ho Chi Minh Mausoleum and Museum, Ho Chi Minh Stilt House and One Pillar Pagoda. Continue to Visit Quan Thanh Temple and Tran Quoc Pagoda – one of the oldest pagoda in Hanoi. Lunch in local restaurant. Visit Temple of Literature – Vietnam’s first university, now becomes a quite get-away place in the middle of vibrant Hanoi. Continue to Ethnology Museum – one of the best museum in the country with real demonstrations of all the tribes cultures. Dinner in local restaurant before transferring to Hanoi Train station for a night train to Lao Cai. Overnight on 4 berth soft sleeper sharing cabin. Please note check out time today is 12:00, you can leave all your luggage at the hotel. Overnight on train/ sharing 4 berths in cabin. Meet your guide and driver at Lao Cai station upon your arrival, take a quick shower and enjoy breakfast in a local restaurant before transfer uphill the Hoang Lien Son mountain range. The smooth road winds its way higher and higher on the mountain slopes. After an hour drive with several stops for marvelous scenery you will arrive in the center of Ta Phin, a beautiful valley surrounded by pine tree plantations and terraced rice paddies which is home to the Black H’mong and Red Zao peoples. Leaving the car for about an hour walk around the valley and paying visit to local homes you will be welcomed by friendly peoples and witnessing their unique way of life. Continue driving to Sapa, check in your hotel and enjoy along break before Lunch. 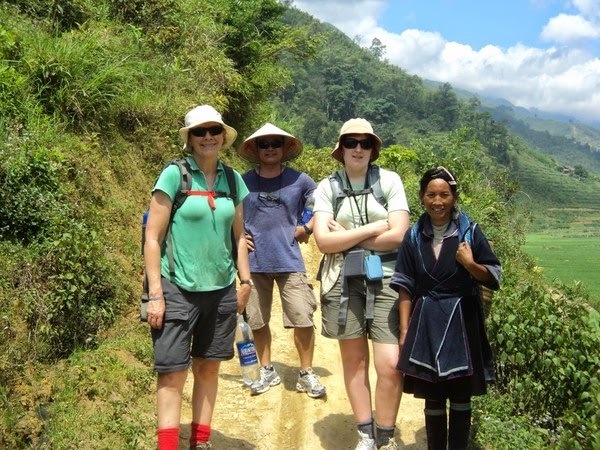 Your guide will meet you again for the afternoon walk to visit Sapa’s market and church before ascending uphill the Ham Rong mountain for visiting a charming orchid garden and great view of Sapa town as well as Fansipan mountain and surrounding valleys. The rest of the afternoon is for your own, wandering the charming town. Arrive Hanoi at about 5am. Free time for shopping until you transfer to airport by private vehicle (meeting point need to be arranged). If you need a hotel for refreshment, please contact us. End of services.